A Century of Physics - American Physical Society (APS) interactive timeline presents the story of physics in the 20th century. ABC's of Nuclear Science - A brief introduction to nuclear science, looking at antimatter, beta rays, cosmic connection and more. AIP Physics News - A digest of physics news items arising from physics meetings, physics journals, newspapers and magazines, and other news sources from the American Institute of Physics. ALICE (A Large Ion Collider Experiment) - The ALICE Collaboration has built a dedicated heavy-ion detector to exploit the unique physics potential of nucleus-nucleus interactions at LHC energies. Its aim is to study the physics of strongly interacting matter at extreme energy densities, where the formation of a new phase of matter, the quark-gluon plasma, is expected. The existence of such a phase and its properties are key issues in QCD for the understanding of confinement and of chiral-symmetry restoration. For this purpose, it is carrying out a comprehensive study of the hadrons, electrons, muons and photons produced in the collision of heavy nuclei. ALICE is also studying proton-proton collisions both as a comparison with lead-lead collisions and in physics areas where ALICE is competitive with other LHC experiments. Also see ALICE at CERN. ALPHA Experiment - An international collaboration based at CERN, and who is working with trapped antihydrogen atoms, the antimatter counterpart of the simplest atom, hydrogen. By precise comparisons of hydrogen and antihydrogen, the experiment hopes to study fundamental symmetries between matter and antimatter. Also see ALPHA | CERN page. APS News Online - American Physical Society news. APS Physics Tip Sheet - American Physical Society abstracts of journal articles. Argonne Physics Division - The research program in the Physics Division contains studies on the properties of nuclei and atoms. Experiments at the Divisions' heavy-ion accelerator ATLAS study the structure of the nucleus, e.g. the interplay between its tendency to act like a classical liquid drop and its propensity to behave like a microscopic object consisting of a few interacting nucleons or how the nucleus is affected by spinning or heating it. Other experiments at higher-energy accelerators, using more violent collisions with projectiles such as electrons or protons, study the quarks inside the nucleus. arXiv.org e-Print Archive - Open access to over 743,000 e-prints in physics, mathematics, computer science, Quantitative biology, quantitative finance and statistics. Atomic Archive - Explore the history, science, and consequences of the atomic bomb. Atomic and Plasma Physics Databases - Maintained by the Plasma Laboratory of Weizmann Institute of Science. Bell, John Stewart - Physicist, and the originator of Bell's Theorem, one of the most important theorems in quantum physics. 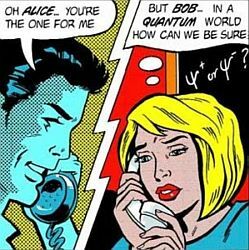 Bell's theorem shows that the predictions of quantum mechanics (QM) are not intuitive, and touches upon several fundamental philosophical issues related to modern physics. Bell's theorem is a no-go theorem, loosely stating that: "No physical theory of local hidden variables can ever reproduce all of the predictions of quantum mechanics." Also see "Spooky Action at a Distance" for an explanation of Bell's theorem by Gary Felder; "John Bell and the Most Profound Discovery of Science" from BBC; and the Trieste Lecture of John Stewart Bell. Biological Physics Group - Supports the UK research community in all fields of biologically inspired physics. Cambridge Relativity - Cosmology, black holes, cosmic strings, inflation, quantum gravity. Center for the History of Physics - Preserves and makes known the history of modern physics and allied fields including astronomy, geophysics, optics, and the like. Collected papers of Albert Einstein - Princeton University Press presents The Digital Einstein Papers, an open-access site for The Collected Papers of Albert Einstein, the ongoing publication of Einstein's massive written legacy comprising more than 30,000 unique documents. College Physics for Students of Biology and Chemistry - Hypertextbook written for first-year undergraduate physics students. Contemporary Physics - Presents authoritative introductory review articles on important recent developments in physics. Articles are written for a wide range of readers, whether they be physicists, physical scientists or engineers employed in higher education, teaching, industry or government. Einstein Archives Online - Extensive archives, constituting the material record of one of the most influential intellects in the modern era. Over 900 digitized manuscripts, archival finding aid, and archival database. Einstein Papers Project - A written legacy that ranges from Einstein's first work on the special and general theories of relativity and the origins of quantum theory to expressions of his concern with civil liberties, Zionism, pacifism, and disarmament. Eric Weisstein's World of Physics - This resource has been assembled over more than a decade by internet encyclopedist Eric W. Weisstein with assistance from the internet community. Ernest Rutherford (1871-1937) - Rutherford's works ensure his immortality. As the The New York Times stated, in a eulogy accompanying the announcement of his unexpected and unnecessary death in 1937. "It is given to but few men to achieve immortality, still less to achieve Olympian rank, during their own lifetime. Lord Rutherford achieved both. In a generation that witnessed one of the greatest revolutions in the entire history of science he was universally acknowledged as the leading explorer of the vast infinitely complex universe within the atom, a universe that he was first to penetrate." Exploring the Table of Isotopes - Periodic Table of the isotopes. Fear of Physics - A friendly, non-technical place for you to come and "play" with the laws of physics. Fermi National Accelerator Laboratory (Fermilab) - Advances the understanding of the fundamental nature of matter and energy by providing leadership and resources for qualified researchers to conduct basic research at the frontiers of high energy physics and related disciplines. Fermilab: Inquiring Minds - High-energy physics research. Feynman Lectures on Physics - Provided by the California Institute of Technology. Fluid Dynamics Links - Links to sites of interest to students and researchers in fluid dynamics. Fundamental Physics Prize - Dedicated to advancing our knowledge of the Universe at the deepest level by awarding annual prizes for scientific breakthroughs, as well as communicating the excitement of fundamental physics to the public. GridPP Project - A collaboration of particle physicists and computing scientists from the UK and CERN, who are building a grid for particle physics. Glossary of Nuclear Terms - Focuses on radioactive decay, presenting animations accurate enough to display conservation of charge, momentum, mass and energy. HyperPhysics - An exploration environment for concepts in physics which employs concept maps and other linking strategies to facilitate navigation. INSPIRE - CERN, DESY, Fermilab and SLAC have built the next-generation High Energy Physics (HEP) information system, INSPIRE, which empowers scientists with innovative tools for successful research at the dawn of an era of new discoveries. INSPIRE combines the successful SPIRES database content, curated at DESY, Fermilab and SLAC, with the Invenio digital library technology developed at CERN. INSPIRE is run by a collaboration of the four labs, and interacts closely with HEP publishers, arXiv.org, NASA-ADS, PDG, and other information resources. Institute of Physics (IOP) - Works to advance physics research, application and education; and engages with policy makers and the public to develop awareness and understanding of physics. Its publishing company, IOP Publishing, is a world leader in professional scientific communications, providing a range of journals, magazines, websites and services. Interactive Plasma Physics Education Experience (IPPEX) - Interactive plasma physics topics, ranging from electricity, magnetism, energy, and fusion. International Journal of Modern Physics A - Review articles and original papers covering the latest research developments in particles and fields, gravitation and cosmology. International Journal of Modern Physics B - Developments in condensed matter, statistical, applied physics and high-Tc superconductivity. International Journal of Modern Physics C - Computational physics, physical computation and related subjects. International Journal of Modern Physics D - General relativity, quantum gravity, gravitational experiments, quantum cosmology, observational cosmology, particle cosmology, large scale structure, high energy astrophysics, compact objects, cosmic particles and radiation. International Journal of Modern Physics E - Experimental, theoretical and computational nuclear science, and its applications and interface with astrophysics and particle physics. ITER - In southern France, 35 nations are collaborating to build the world's largest tokamak, a magnetic fusion device that has been designed to prove the feasibility of fusion as a large-scale and carbon-free source of energy based on the same principle that powers our Sun and stars. Journal of High Energy Physics (JHEP) - A scientific journal written, run, and distributed by electronic means. The journal complements the present archives system of preprint distribution (at arXiv and mirror sites) that has so successfully replaced the conventional system, by introducing an automated and electronic version of the refereeing procedure. Journal of Modern Optics - Publishes original contributions to optical knowledge from educational institutions, government establishments and industrial R&D groups world-wide. Journal of Statistical Mechanics: Theory and Experiment (JSTAT) - Peer-reviewed journal of statistical physics. Kaku, Michio - Dr. Michio Kaku, an authority in theoretical physics and the environment, hosts a weekly hour-long program called Explorations on WBAI-FM radio in New York (99.5 FM) which can also be heard on KPFA-FM (94.1 FM) in the San Francisco Bay Area. Large Hadron Collider (LHC) - The LHC is an accelerator which brings protons and ions into head-on collisions at higher energies than ever achieved before. This will allow scientists to penetrate still further into the structure of matter and recreate the conditions prevailing in the early universe, just after the Big Bang. The gigantic scientific instrument near Geneva, where it spans the border between Switzerland and France about 100 m underground. Also, visit this page. Large Hadron Collider (LHC) Computing Grid Project (LCG) - The computational requirements of the experiments that will use the LHC are enormous: 12-14 petabytes of data will be generated each year, the equivalent of more than 20 million CDs. Analysing this will require the equivalent of 70,000 of today's fastest PC processors. The accelerator will start operation in 2007 and will be used to answer the most fundamental questions of science by some 6,000 people from universities and laboratories all around the world. The goal of the LCG Project is to meet these unprecedented computing needs by deploying a worldwide computational grid service, integrating the capacity of scientific computing centres spread across Europe, America and Asia into a virtual computing organisation. Laser Interferometer Gravitational-Wave Observatory (LIGO) - Designed to open the field of gravitational-wave astrophysics through the direct detection of gravitational waves predicted by Einstein's General Theory of Relativity. LIGO's multi-kilometer-scale gravitational wave detectors use laser interferometry to measure the minute ripples in space-time caused by passing gravitational waves from cataclysmic cosmic sources such as the mergers of pairs of neutron stars or black holes, or by supernovae. LIGO consists of two widely separated interferometers within the United States -- one in Hanford, Washington and the other in Livingston, Louisiana -- operated in unison to detect gravitational waves. Lawrence Livermore National Lab - Programs in advanced defense technologies, energy, environment, biosciences, and basic science to enhance the competencies needed to ensure the safety and reliability of U.S. nuclear weapons stockpiles. laws list, the - A list of various laws, rules, principles, and other related topics in physics and astronomy. LivePhysics - Dedicated to physics, science, space and technology news, latest research breakthroughs and innovations, science advances, and a scientific discussion forum. Living Reviews in Relativity - A refereed solely electronic journal offering reviews in all areas of relativity. Living Textbook of Nuclear Chemistry - Supplemental materials related to the study and practice of nuclear chemistry. Los Alamos National Laboratory (LANL) - U.S. agency whose mission is to ensure the safety and reliability of the U.S. nuclear weapons stockpile; to reduce threats to U.S. security; to use science to clean up the legacy of the Cold War; and to provide technical solutions to key energy, environment, infrastructure, and health security problems. Also see the Site Map and Library Without Walls. Modern physics Letters A - Research papers covering current research developments in Gravitation, Cosmology, Nuclear Physics, and Particles and Fields. Modern Physics Letters B - Research findings in condensed matter physics, statistical physics, applied physics and high-Tc superconductivity. National Ignition Facility (NIF) - Located at the Lawrence Livermore National Laboratory in Livermore, California; the world's largest laser. NIF's 192 intense laser beams can deliver to a target more than 60 times the energy of any previous laser system. NIF became operational in March 2009 and is capable of directing nearly two million joules of ultraviolet laser energy in billionth-of-a-second pulses to the target chamber center. Nature Physics Portal - A one-stop resource for physicists, providing highlights of the latest research in Nature and elsewhere. Net Advance of Physics, The - Physics review articles and tutorials in an encyclopædic format. NIST Physical Measurement Laboratory - Measurements and research for electronic, optical, time and frequency, and radiation technologies at the National Institute of Standards and Technology (NIST). Nuclear Chemistry and the Community - Introduction to: the relationship of energy and matter; the origins of nuclear energy; the use of nuclear energy for power and weapons; high energy radiation; how spent nuclear power fuels are potential sources of nuclear weapons; and insight into questions about nuclear issues that are in the news. Nuclear Files - Basic knowledge about fission and fusion. Issues, resources, news. Office of High Energy and Nuclear Physics - One billion dollar per year basic research program provides insights into the nature of energy and matter and operates world-class scientific facilities in the U.S.
Official String Theory Web Site - Survey of superstrings. Particle Adventure - Introduces the theory of fundamental particles and forces called the Standard Model and explores the experimental evidence and reasons physicists want to go beyond this theory. Pendulum Lab - A virtual laboratory where you can do hands-on experiments at rigid pendula. Together with the material presented in the lecture room, you can learn basic issues like harmonic oscillator and resonance but also advanced topics like parametric resonance, nonlinear dynamics, and chaos. Phys.org: Physics - Physics news channel. Physics - Provides brief explanations of selected physics research published in Physical Review and Physical Review Letters. Physics 2000 - An interactive journey through modern physics. Physics Central - American Physical Society site keeps you informed with daily updates on physics in the news, the latest physics research and the people who are doing it and, if you want more, where to go on the web. Physics e-print Archive - Automated e-print archives. Physics Egypt - Promotes the professional, academic and social communication between its members and physics associations, and organizations. Physics Factbook - An encyclopedia of scientific essays written by high school students. It is an exercise in library research methods in which students are sent out in search of a measurement with the intent of having them find more than just a number with a unit. Physics News - News and information related to physics. Physics Tutorials - Physics tutorials, exercises, and sample exams. PhysicsWorld - Global physics news and information. Events page covers conferences, summer schools, workshops, and other physics events. PhysLink - Comprehensive research and education tools designed for physicists, engineers, educators, students, and all other curious minds. PhysNet - Links to all physics institutions worldwide ordered by country and town and a search facility through local physics institutions for locally stored documents. PhysOrg - Physics, technology, and nanotechnology news. Plasma on the Internet - Maintained by the Plasma Laboratory of Weizmann Institute of Science. Quaero - A method that 1) enables the automatic optimization of searches for physics beyond the standard model, and 2) provides a mechanism for making high energy collider data generally available. This web page provides an interface to data collected by the DØ experiment at the Fermilab Tevatron, enabling fast and automatic testing of models predicting new phenomena at the scale of several hundred GeV. Review of Particle Physics, The - The Particle Data Group is an international collaboration charged with summarizing particle physics, as well as related areas of cosmology and astrophysics. In 2008, the PDG consists of 170 authors from 108 institutions in 20 countries. The summaries are published in even-numbered years as a now 1340-page book, the Review of Particle Physics, and as an abbreviated version (294 pages), the Particle Physics Booklet. The Review is published in a major journal, and in addition the PDG distributes 16,000 copies of it and 31,000 copies of the Booklet. The Review has been called the "bible of particle physics"; over the years, it has been cited in 30,000 papers. Sanford Underground Laboratory - South Dakota's Sanford Laboratory will host a broad range of experiments for scientific research on neutrinos and dark matter particles at several levels of the former Homestake gold mine in Lead, from the surface to 4,850 feet underground. Scitation - Designed to help researchers find information published in American Institute of Physics (AIP) journals. Selected Papers of Great American Physicists - The bicentennial commemorative volume of The American Physical Society. SLAC National Accelerator Laboratory, Menlo Park, CA - Home to a two-mile linear accelerator-the longest in the world. Originally a particle physics research center, SLAC is now a multipurpose laboratory for astrophysics, photon science, accelerator and particle physics research. Sanford Underground Research Facility - Located in Lead, South Dakota. Provides laboratory space deep underground where sensitive physics experiments can be shielded from cosmic radiation. Researchers at the Sanford Lab are exploring some of the most challenging questions facing 21st century physics, such as the origin of matter, the nature of dark matter and the properties of neutrinos. Stephen Hawking's Universe - The British theoretical physicist Stephen Hawking has devoted much of his life to probing the space-time described by general relativity and the singularities where it breaks down. Stephen Hawking's Web Site - Biography, lectures and news about future lecture dates. Supersymmetry (SUSY) - A proposed symmetry of nature relating two basic classes of elementary particles: bosons, which have an integer-valued spin, and fermions, which have a half-integer spin. Each particle from one group is associated with a particle from the other, called its superpartner, whose spin differs by a half-integer. In a theory with unbroken supersymmetry each pair of superpartners shares the same mass and internal quantum numbers besides spin, but since no superpartners have been observed yet, supersymmetry must be a spontaneously broken symmetry. The failure of the Large Hadron Collider to find evidence for supersymmetry has led some physicists to suggest that the theory should be abandoned. Also see Introduction to Supersymmetry. Synchrotron-Light for Experimental Science and Applications in the Middle East (SESAME) - An independent laboratory formally created under the auspices of UNESCO on 30 May 2002. It is located in Allan, by the Al-Balqa nahia of the Balqa governorate of Jordan. The founding members of SESAME are Bahrain, Cyprus, Egypt, Iran, Israel, Jordan, Pakistan, the Palestinian Authority, and Turkey. As an intergovernmental scientific and technological centre of excellence open to all scientists from the Middle East and elsewhere, SESAME will spur scientific, technical, and economic development of the region and strengthen collaboration in science. Symmetry - A magazine about particle physics and its connections to other aspects of life and science, from interdisciplinary collaborations to policy to culture. Published 6 times per year by Fermi National Accelerator Laboratory and SLAC National Accelerator Laboratory. Also browse its Awards and Prizes page. Werner Heisenberg and the Uncertainty Principle - Werner Heisenberg is best known as a founder of quantum mechanics and for the uncertainty principle in quantum theory: The more precisely the position is determined, the less precisely the momentum is known." World Scientific: Physics - Science and technology journals physics. This webpage last updated on Sunday, November 26, 2017 3:43 PM.